We make a lot of homemade pizza. It’s a Friday night staple at my house. Usually I make the dough – or buy it (often from Trader Joe’s). Other times, we’ll make pizza on bagels or English muffins. But our new favorite way is on naan, the flatbread that’s popular in India and elsewhere and is found at most any grocery store. We already eat a lot of naan – dipping it in hummus, pairing it with a yummy curry, turning it into sandwiches or just enjoying it on its own. 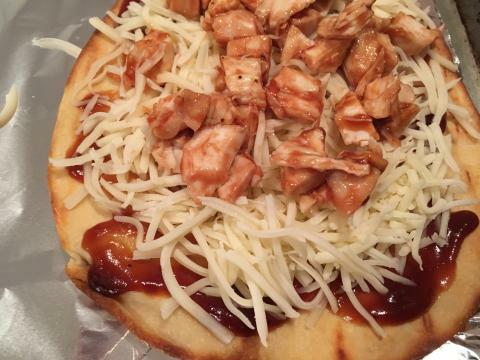 And now we’ve added naan pizza to the mix. 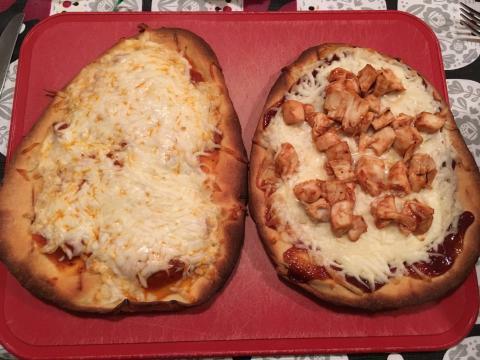 In fact, my older daughter likes naan pizza better than the pie I make with homemade dough! The trick to making pizza with naan is to make sure the bread is nice and crisp before you put the toppings on it. That ensures that the crust doesn’t get mushy from the sauce. Here’s how to do it. Line a baking sheet with aluminum foil and preheat your oven to 400 degrees. Bake the naan directly on the oven rack for about two to four minutes and until its nice and crispy. Be sure to keep checking on it so it doesn’t burn. Using an oven mitt or metal tongs, take the crispy bread out of the oven. Place the bread on a baking sheet – usually two flatbreads per standard-sized sheet – and top with toppings. Bake for about 8 minutes – until the cheese is melted. Slice and serve!